Missing A Tooth? Dental Implants May Be The Answer! Home » Missing A Tooth? Dental Implants May Be The Answer! Dental implants replace missing teeth. Treatments are carried out to fix an unsightly gap in your smile. A Brisbane dentist will perform this type of dental restoration treatment if a missing tooth impacts your confidence, appearance or functionality. When the gap in your teeth affects your smile and confidence. To preserve the appearance of your face when missing teeth equate to sunken cheeks. As an alternative to dentures. Fitting dental implants is a form of cosmetic dentistry. Implants offer a permanent solution to missing teeth. 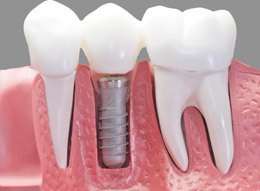 A dental implant is an artificial tooth, custom made to fit your gap. The artificial tooth is surgically attached to your jaw bone. Once the procedure is done, you are left with a natural looking, fully functional tooth. Although dental implants cost more than your average cosmetic dentistry, they work wonders in restoring your smile. A dental bridge will act as a bridge to cover a gap of more than one tooth. A false missing tooth will be anchored in place by neighbouring crown capped teeth. False teeth that fill the gap in a bridge treatment are called pontics. With dental implants, your Brisbane dentist will only need to replace the missing tooth. Neighbouring teeth are not required to support dental implants. The cost of a dental bridge procedure vs dental implant prices will be less. It is possible that a bridge will need replacing later, whereby a dental implant is permanent. Rob Duhig Dental, your local dentist in North Brisbane, will assess your situation, and work on a dental implant plan to help you. Dental implant prices can be broken down into part payments, making treatments more affordable. Call Rob Duhig Dental on 07 3269 2443 today or complete the online contact form.